Are you in need of a healing touch from God? Prayer is a major weapon in your healing battle. This Christian healing prayer can help you approach God's throne with faith, knowing that He is more than willing to supply all of your needs. Recently, science has even been confirmting the link between prayer and healing. Physicians have performed actual studies on the affects of prayer on the health of their patients. 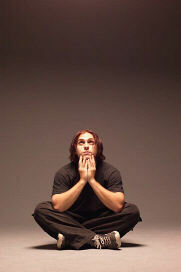 They found that the patients who pray have a higher percentage chance of regaining their health than those who do not. They have even found this to be true for people receiving intercessory prayer, proving that the differences that doctors are observing are not just psychological. All healing comes from God. It does not matter if He leads you to your restoration through adopting Bible nutrition, or even if He chooses to use a physician - He is still your Source! Christian healing prayer is a way for you to connect with the real Source from which all life flows. Many people think that God will always answer our prayers. I tend to disagree with them, but not for the reasons that you may think. I believe that God really does want to fulfill our needs. But, sometimes we are just not praying in line with His Word. If we are praying outside of the promises that He has already made, how can we expect Him to move on our behalf? That is the main difference between the Christian healing prayer that I am going to share with you today, and many other healing prayers that you may find else ware - This one is based on the Word of God. When you base your prayers on the Word of God, you actually have something to stand on. This makes the prayer much more powerful for two main reasons. Praying God's Word has power because it focuses on gifts that He has already laid out for you - You are merely claiming those gifts through prayer. God's Word is also the sword He has given you to engage in spiritual warfare with the devil, so using it in prayer is a powerful 1-2 punch (Ephesians 6:10-17)! Biblical Christian healing prayer also has another benifit. Since you know that you are definitely praying God's will, you are able to add in a very key ingredient to your prayers - FAITH! And it is your faith, not your fear, that will get God's attention! Another great way to unleash the power of God's Word is by confessing healing scriptures aloud. 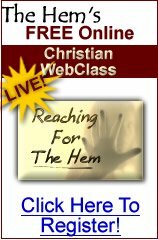 To learn more about the power of healing scriptures, and to print out the free scripture meditation cards that accompany this Christian healing Bible study course, Click here. Print it off. Stick it on your bathroom mirror and read it during your regular morning routine. Laminate it. Hang the laminated sheet inside your shower and read it aloud to the Lord each morning. Record it. When recording, pause after you read each sentence to leave space for repetition. Play the recording as you get dressed or on your drive to work, and repeat the prayer line by line in the space that you left. Carry It. Write your Christian healing prayer out on 3X5 cards and carry it in your purse or pocket. Whenever you feel a symptom coming on, pull it out and read it to the Lord. Click here for a printable version of this Christian healing prayer. Jehovah Rapha - The Lord That Heals Me! I come before you and praise you this day and every day, because I am fearfully and wonderfully made, Lord. It was You that carefully designed every system, organ and gland in my body, and gave each one their tasks. I ask that you remind each one of the task it is given, and help them all to perform them perfectly. Father God, you have said that I have the keys to the kingdom of heaven, and that whatever I bind on earth is bound and whatever I loose on earth is loosed! So, with that power, this day, in the mighty name of Jesus, I declare that my body is Your temple and I choose to glorify You with it. I bind any sickness or disease that has been trying to attack my body. I command it to flee in the name of Jesus so that I can present a healthy body to my Lord as a living sacrifice unto Him. Lord, you have said that, through Jesus Christ, I am redeemed from the curse of the law. So, I receive that redemption right now in Jesus name. No weapon of sickness or disease formed against me shall prosper any longer! In Your Word, you have promised that You will restore me to health and heal my wounds. Because I serve You, You said You would bless my food and take sickness away from me. Because I listen closely to every Word that You speak, and I keep them in my heart, You promised that they would be life and health to my whole body. I choose to believe those promises Father. Help me to believe them more than I believe the doctors that I visit or the symptoms I feel. Help me to stand on Your holy Word today and everyday. Right now, today, I confess that Jesus Himself bore my pains and carried my sicknesses. He was pierced for my transgressions and crushed for my iniquities. The punishment for my well-being fell on Him, and by His stripes I am healed and made whole! Anything that was out of balance in my body, through Jesus' sacrifice, is now put back into balance. Anything trying to work death in my body is itself withering and dying, because You Father have promised that I will live and not die! Thank You, Father, that my light breaks forth as the morning and that my health springs forth speedily! I pray right now that the Holy Spirit would give power to the words of this Christian healing prayer as you speak them out of your own mouth to the Lord. And, I pray that each time you read it, the promises that it holds will become more real to you than your circumstances. That the peace that passes all understanding will fall upon you and be your comfort as God manifests His healing power in your life. In Jesus Name - Amen! 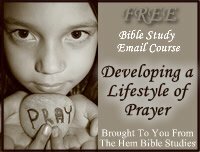 If you want to make prayer a larger part of your entire life, you may also want to check out my free email bible study on prayer. Finished with your Christian Healing Prayer?